Before the Internet was a primary tool for communication, and many years before I started writing this blog, print newsletters were used to share ideas. 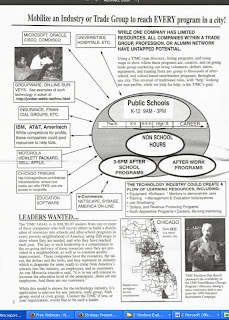 This is page 2 from the Fall 1999 Tutor/Mentor News. I started publishing this newsletter in 1993 and continued every four months through 2001. At its peak I was sending this to over 8,000 people. I now have that many visits to my web sites every month. 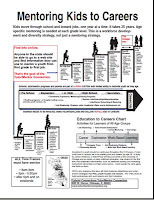 In the graphics on this page of the newsletter I'm communicating a goal that every industry build strategies that support the growth of long-term, non-school, mentor-rich, volunteer-based youth serving organizations. 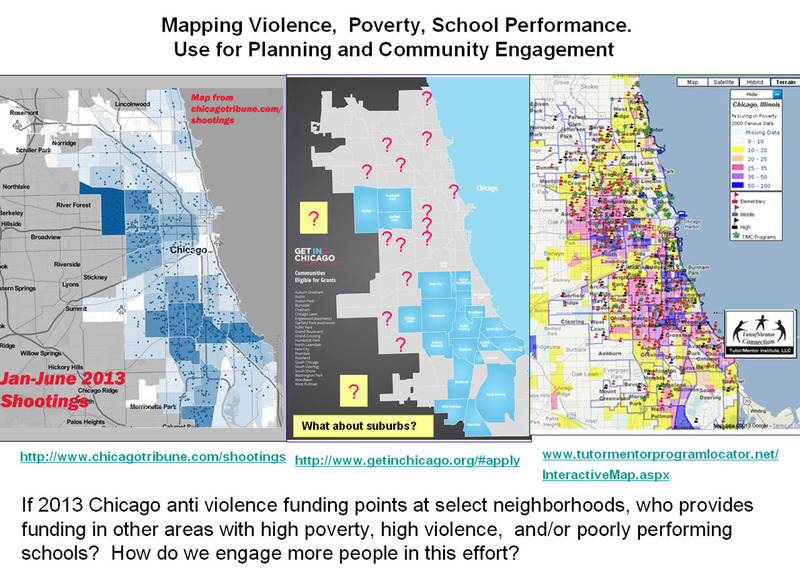 The graphic shows that programs are needed in three time frames, school day, right after school, after-work/weekends and it includes a map, illustrating that such programs are needed in every high poverty neighborhood of the Chicago region. I started communicating this strategy in power point/pdf essays in the late 1990s, and have been posting them on Scribd.com and SlideShare in the past two years. I've posted a library of graphics from these presentations on Pinterest. The essays on Scribd have been viewed more than 64,000 times in less than two full years. Interns have worked with me for many years and since 2005 I've had them spend time looking at these graphics and PDF essays, then build new versions that share their own understanding of the ideas, using different types of media to communicate the ideas. 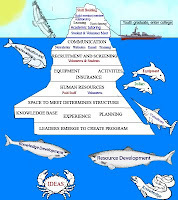 This "iceberg" graphic was created to illustrate the infrastructure every tutor/mentor program needs in order to support on-going connections of youth and volunteer tutors/mentors. It was created by an intern several years ago. At the right is an animation, created by another intern, providing a different interpretation of the same idea. Here's another example. 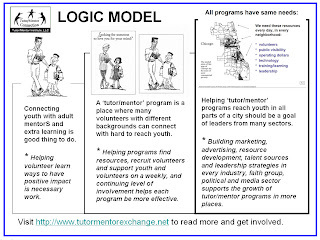 In this PDF I show that as volunteers spend time (service) in tutor/mentor program, they are learning more about poverty and the needs of youth. They are also expanding their personal network and building new skills. Each week as they do service they informally share stories of what they are learning with friends, family and co-workers, which leads to more people becoming involved. The graphic below was created in 2007 by an intern from Hong Kong, to interpret the message in the PDF. Then it was re-done a few years later by an intern from Korea working with one of our Northwestern University Public Service Fellows. Here's the latest version. Thus, for more than 15 years I've been sharing ideas that leaders in any industry, politics, universities, and/or faith groups, etc. could be using in their own efforts to help k-12 youth in every high poverty neighborhood have a wide range of tutor/mentor programs to participate in, with an overall goal of helping kids move through school and into jobs, with a growing number of volunteers from different industry, business and social/economic backgrounds helping. I've created a web library where I post links to work being done by other organizations, researchers, idea people, etc. Most of the links I point to host their own web library. They serve as a hub for additional knowledge. 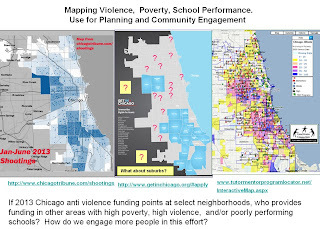 I'd like to find a web library pointing to places on business, political, media and celebrity web sites where visualizations like I've created are being used to show their own commitment to helping kids in ALL POVERTY NEIGHBORHOODS move through school and into jobs. If you're hosting such a web library, or see this as a research project for you and your students, please share your web site so I can point to it in my own efforts. With so much information available how do we navigate this, find what we're looking for, make sense out of it, then apply it to our own personal agendas? 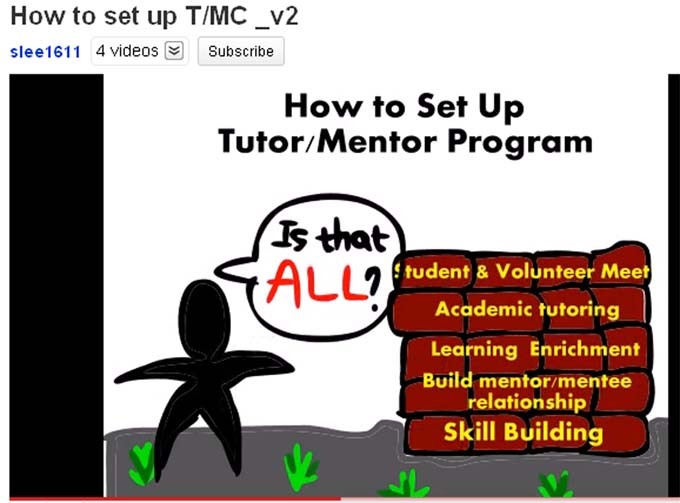 I've been aggregating information that people could use to help inner city kids for more than 20 years and host it in a web library on the Tutor/Mentor Connection and Tutor/Mentor Institute, LLC site. It's a huge amount of information and no one can absorb it in a short time. Frankly, without some help from others, most of the great ideas and resources on the site will be undiscovered. Thus, I've been following the growth of on-line learning, connectivism and MOOCS, with great interest. Today one of the people I met during the Jan-March Education, Technology and Media MOOC, #ETMOOC, encouraged me and others to view this article posted by Christina Hendricks, describing her own experience during the ETMOOC. She does such a great job I encourage you to read what she has written, then browse some of the articles I've written that focus this process on building a network of people and organizations working to help youth in high poverty neighborhoods of Chicago and other cities. I've used this graphic dozens of times to illustrate a vision of engaging workplace volunteers in long-term strategies that help inner-city youth move from first grade to first jobs. I've created a library of graphics like this on Pinterest and posted a library of illustrated essays on Scribd.com. 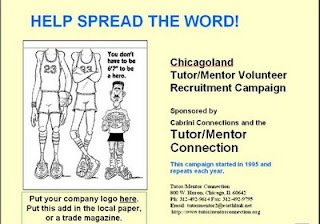 I started doing this almost 20 years ago when I created the Tutor/Mentor Connection, at the same time as I and six other volunteers were creating the Cabrini Connections tutor/mentor program in Chicago. Every year since then, I've invested time, talent, and a fragmented flow of dollars to build the Tutor/Mentor Connection. Doing this as part of a single tutor/mentor program provided many benefits, but it also made it difficult for leaders throughout the region to clearly understand the T/MC strategy. This is another graphic I've used often. 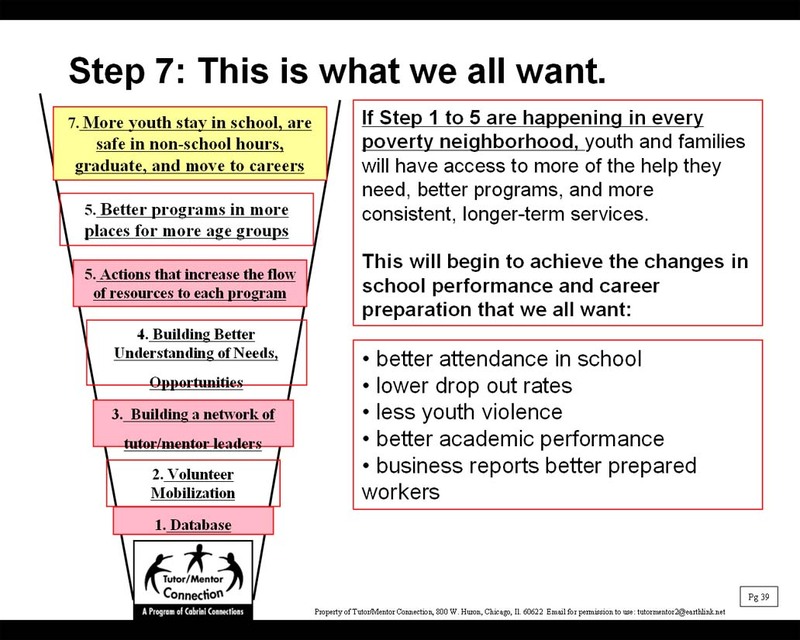 We all want the outcomes shown at the top of this graphic, but without the work at the bottom, too few people are connected to each other, and too few are working strategically to support age-appropriate tutoring, mentoring, learning, jobs programs, etc. in every high poverty neighborhood of the city and suburbs. Recently a friend send me a document from the World Economic Forum, titled "Multistakeholder Collaboration for Healthy - Living Toolkit for Joint Action". 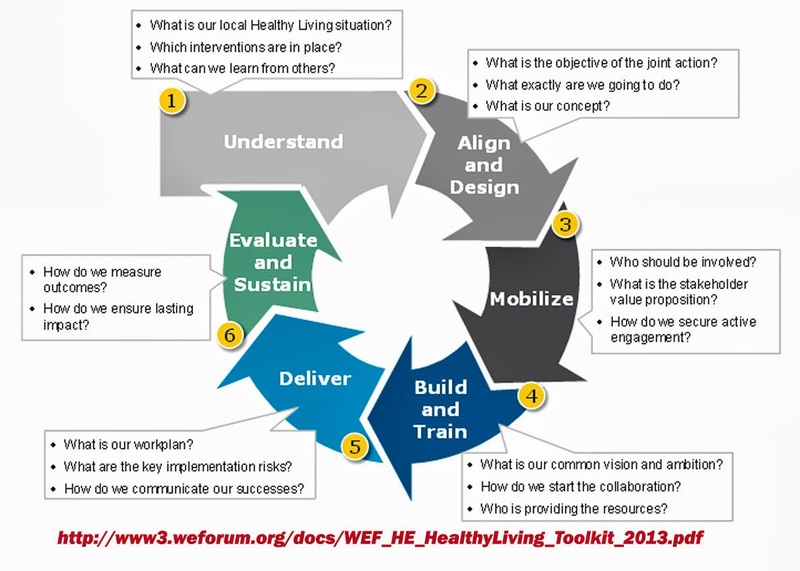 On the web site where this PDF is shared, is a message saying "To assist stakeholders in initiating and managing multistakeholder actions for Healthy Living, the Forum and the Pan American Health Organization, in collaboration with Bain & Company, have developed the “Toolkit for Multistakeholder Action”. The Toolkit is based on a simple six-block framework to help collaborations structure and progress with their joint work. It provides step-by-step guidelines, hands-on templates, practical resources and case studies to illustrate solutions to the core challenges of multistakeholder actions at the local, national or global level." On page 8 of this pdf this graphic illustrates the six steps of multi-stakeholder collaboration. 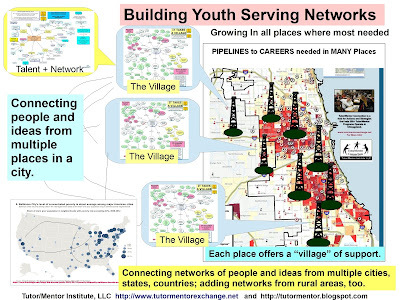 In this concept map, I point to several dozen intermediary organizations working in the Chicago region and focused on the well-being of youth. If you know leaders in these organizations, I encourage you to share the PDF with them. Many have asked me for the strategic plan of the Tutor/Mentor Connection. While I've created written versions of this countless times since 1993, I feel that "my web sites" are the plan, and are the plan in action! Anyone who is willing to spend the time, can browse through the web sites and learn the strategies I've developed over the past 20 years, and apply them to their own work. I've created a variety of PDF essays to summarize what I'm trying to do, such as this one. I've also created a series of concept maps, that show the vision of helping youth in poverty move to jobs, and this one showing the 4-part strategy that supports what leaders can do to help make this happen. 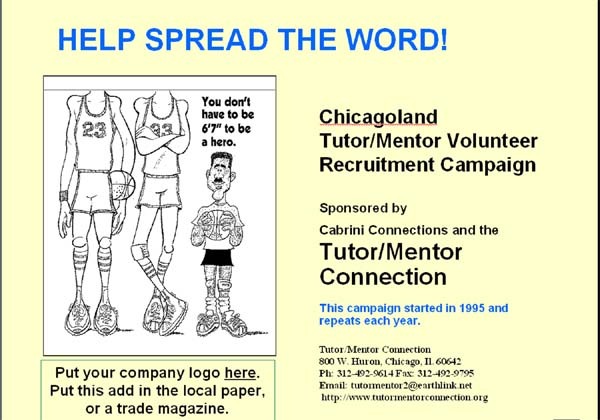 In 2011 after the Cabrini Connections board of directors voted to no longer support the Tutor/Mentor Connection, I created the Tutor/Mentor Institute, LLC as a business structure to keep the T/MC available in Chicago and to help similar intermediaries grow in other cities. I created this WIKI to show my goals, and this PDF to show value of the Tutor/Mentor Institute, LLC to others. 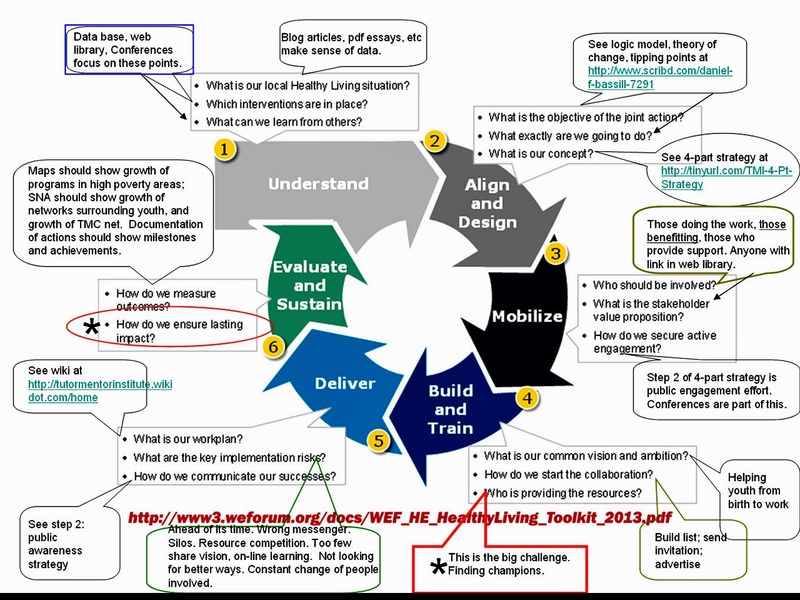 After reviewing the WEB graphic, I created a new version, showing actions I have been taking related to each of the six steps in the tool kit. That graphic is below. I created this concept map, showing the 4-part strategy, and work that needs to be done to support each step of the strategy more fully. I don't have the organizational strength, funds, or talent to do all of this myself. Others need to share ownership, if they also share the vision of helping kids in every poverty neighborhood overcome the violence, poverty, negative aspirations, etc. that face them. This is the type of leadership I provide, and the goal of the Tutor/Mentor Institute, LLC. I believe the ideas and resources I've aggregated, and the tools I continue to develop, can be used by any organization in Chicago that works to help youth and families. In this ROLE OF LEADERS pdf, I invite leaders from business and many other sectors to take the lead in strategies that help kids move from first grade to first jobs. In this RESOURCES pdf, I show tools I've developed to support such leaders in Chicago. With help, these can be developed and used to support leaders sharing similar goals, in any city in the world. It has taken me more than 35 years to develop these ideas, and I'm constantly learning and updating my own thinking. Thus, I hope you and others will take a little time each month over the next few years to understand and apply these ideas in your own thinking. As you do, share what you do on blogs and web sites and I and others will learn from you. If you'd like to connect, why not attend the Tutor/Mentor Leadership and Networking Conference in Chicago on Monday, Nov. 4, or introduce yourself to me on Twitter, Facebook, Linked in or this blog. 9-14-2018 update - I'm still trying to "lead from behind" but with even fewer resources than I had in 2013 when I wrote this. I have not hosted a conference in Chicago since 2013, yet I probably reach and share ideas with far more people every week than ever attended any of the Tutor/Mentor Conferences. If you value what I'm doing please visit my FUND ME page and offer your support. My Mentor. The Father I never Had. 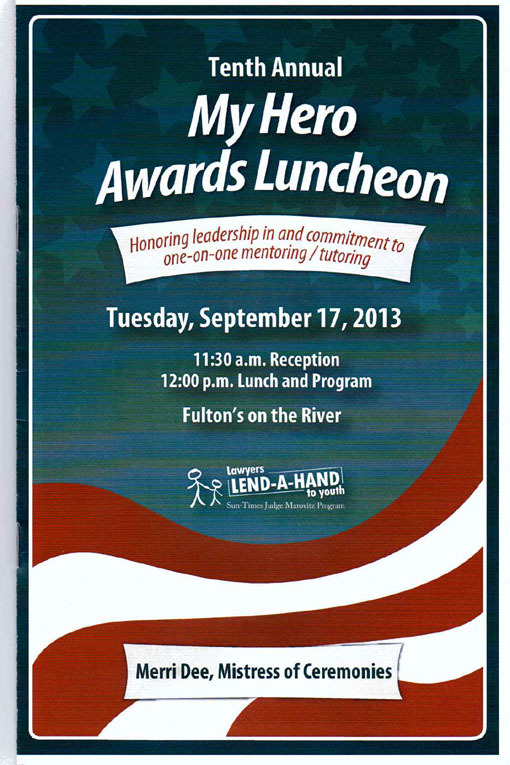 On Tuesday, September 17 I attended the Tenth Annual My Hero Awards Luncheon, hosted by the Lawyers Lend A Hand to Youth Program. This is a group of lawyers from Chicago who have raised more than $1.4 million since 1994 to fund the general operations of volunteer-based tutor/mentor programs in the Chicago region. Read more about this event. 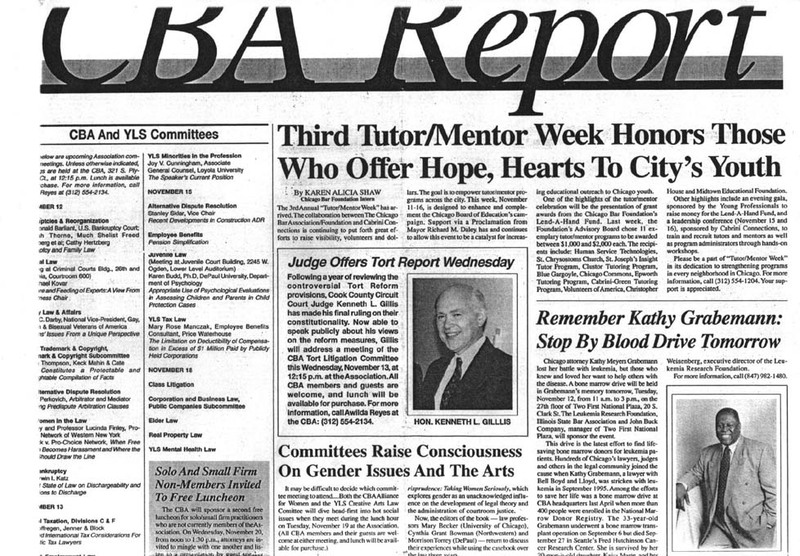 During the late 1990s the Lend A Hand Program was part of the Chicago Bar Foundation and held an annual event in November which attracted more than 1500 lawyers, friends and families. Since 2002 a My Hero Awards Lunch in the spring or fall has attracted more than 200 participants to give recognition to lawyers, law firms, business and judges who are involved with volunteer based tutoring and/or mentoring programs in the Chicago region. During this week's event Doug Wambach, a shareholder at Burke, Warren, MacKay & Serritella, P.C. received one "Making a Difference Award" and Richard Gleason, managing partner of O'Mara, Gleason & O'Callaghan, LLC, received a second award. Wambach has been involved in many roles supporting Boys Hope Girls Hope for more than a decade. He was nominated by a youth he has mentored for the past several years. In the nomination letter, the youth wrote "I haven't been writing about a mentor; I'm writing about a father I never had." In his acceptance comments, Wambach said "He's the one who made a difference in my life, and in my family's life." Gleason has been involved with the mentoring program at the Logan Square Boys & Girls Club in Chicago since 2006. The boy he has mentored for the past 6 years is now working at the club and gave the nomination speech. He said "If it wasn't for Rich, I don't know where I'd be now." Over my 35 years of leading a volunteer-based tutor/mentor program I've heard comments like this from many alumni and volunteers of the programs I've led, and of other programs I've connected with. This has led me to three levels of understanding, which are reflected in the graphic below, and in this Logic Model pdf essay. First, the testimony of young people and volunteers convinces me that connecting youth with volunteers from the business community, and keeping them connected for multiple years, is something we should try to do. Second, to connect youth living in high poverty neighborhoods with volunteers who don't live in the neighborhood, but model many types of work and career experiences that youth might aspire to, structured, well-organized, and well funded programs like Boys Hope Girls Hope and the Logan Square Boys & Girls are needed. Third, since there are more than 125,000 high poverty youth living in Chicago, and many more in the suburbs, we need hundreds of well organized programs, not just the few that are now in existence. For such programs to be in place and well organized, we need organizations like the Lawyers Lend A Hand to be raising millions of dollars from their industry and spreading this money each year to on-going programs throughout the city and suburbs. 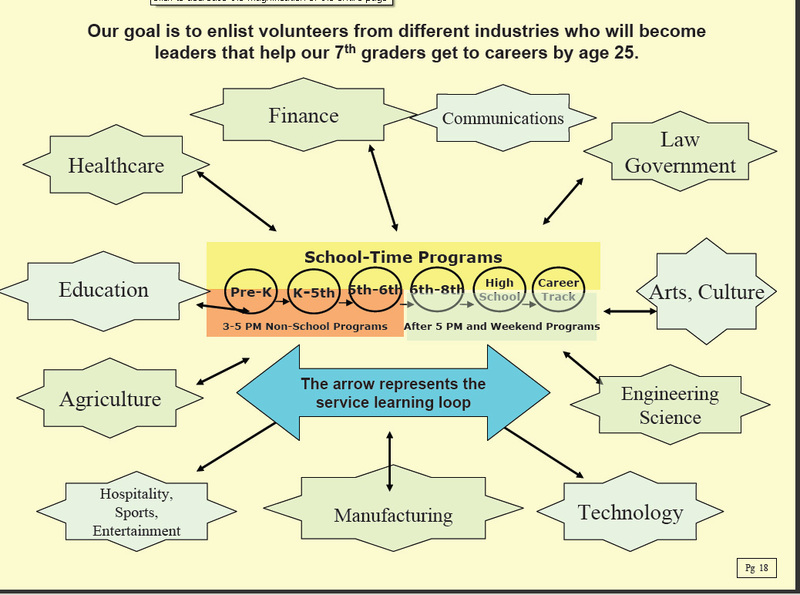 If every industry, fraternal and alumni organization forms a Lend A Hand type program, the result would be multiple sources of on-going funding, and a diversity of volunteers, supporting tutor/mentor programs in every high poverty zip code, thus enabling each program to have a higher percent of the total dollars each needs to operate, as well as a diversity of volunteer talent helping the program innovate ways to constantly improve their impact on the lives of kids....and volunteers. I've been broadcasting this idea for nearly 20 years, yet there are few leaders who have embraced the idea to the point that they should be receiving awards for how well they support "birth to work" mentoring programs in places where they do business or where employees and customers live. Why is this? 1) Maybe I'm the wrong messenger. I'm not from a wealthy family. I'm not the CEO of a big company. I'm not politically connected. I'm not of a minority racial background. 2) The non profits who would benefit most from increased resources, are not embracing the strategy. There's too much fear of losing volunteers or donors by talking about the need for tutor/mentor programs all over the city, rather than just their own program. The competitive nature of philanthropy reinforces this. 3) Business leaders who lead multiple store corporations via central office strategies don't apply the same thinking to what they do to support multiple non profits in all neighborhoods where they are needed. It's easy to adopt one or two high profile programs, or run a small in-house volunteer program. It's harder to take on a role intended to build an distribution of these programs, and a supply system to support them. Read more about how businesses might help programs grow. 4) I've never been able to keep consistent funding or build a large enough funding base to spread these ideas consistently, draw people together for conferences, or teach leaders to adopt and use the ideas. I've written more than 1000 articles on this blog since 2005, all intended to build consistent support for constantly improving tutor/mentor programs in high poverty neighborhoods. In addition, I've created a variety of essays to illustrate ideas that leaders might adopt in support of multiple tutor/mentor programs. Finally, I've created a web library with more than 2000 links to ideas of other people around the world which can be applied to building and sustaining individual programs as well as networks of programs. This is all part of a 4 part strategy, illustrated in this strategy pdf and this concept map. Since 2011 I've not had a non profit organizational structure to support this strategy, and I'm reaching out to find volunteers and partners to re-build this. However, I'm more interested in finding ways to embed these ideas and strategies in many other organizations, in Chicago and around the country, so more owners carry this forward in future years, and so it's not dependent on any single organization or individual. If you're interested in this let's find a way to talk. These ideas and web resources are free to anyone who wants to see more young adults standing up in front of crowds saying "my mentor made a difference in my life." I hope you'll spend some time getting to know them. This photo was on the front page of my Chicago Tribune yesterday. If you're a subscriber to the Tribune's internet site you can read the full story online. 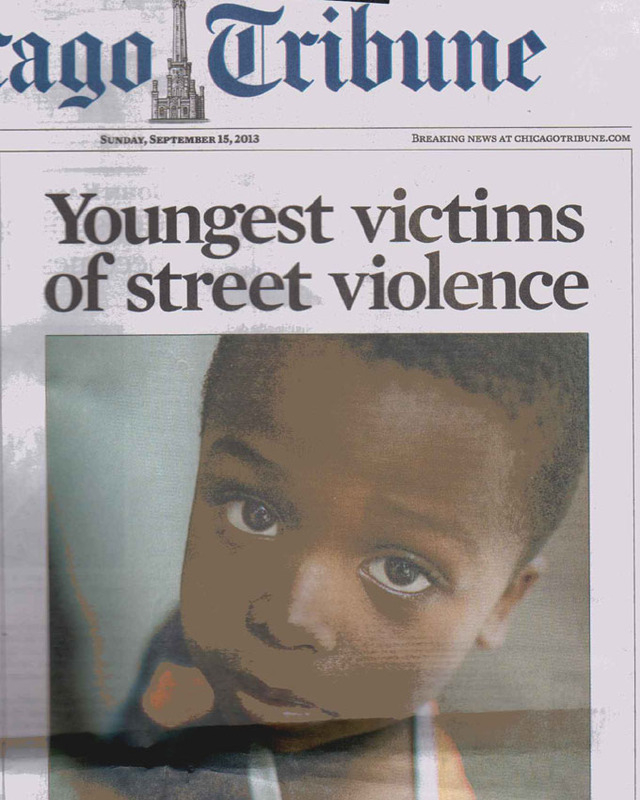 The print version included two full pages of stories about kids in Chicago who have been victims of street violence. 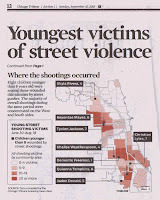 Included was a map showing where these shootings occurred, which is mostly on the West and South parts of Chicago. I've been pointing to media stories like these for the past 20 years as part of an effort to get more people involved in strategies that build and sustain a wide range of youth serving organizations in these areas. Here's one story I wrote in July 2010. 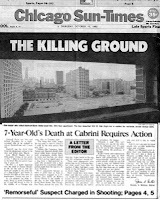 It includes a copy of the Chicago SunTimes from October 1992 after Dantrell Davis was killed. 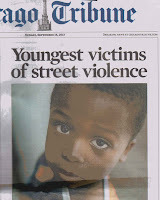 Here's a story I wrote in 2008 following a SunTimes series about how street violence impacts inner city kids. In this I posted maps of neighborhoods where violence was taking place, with a call for people to be involved in supporting those programs. 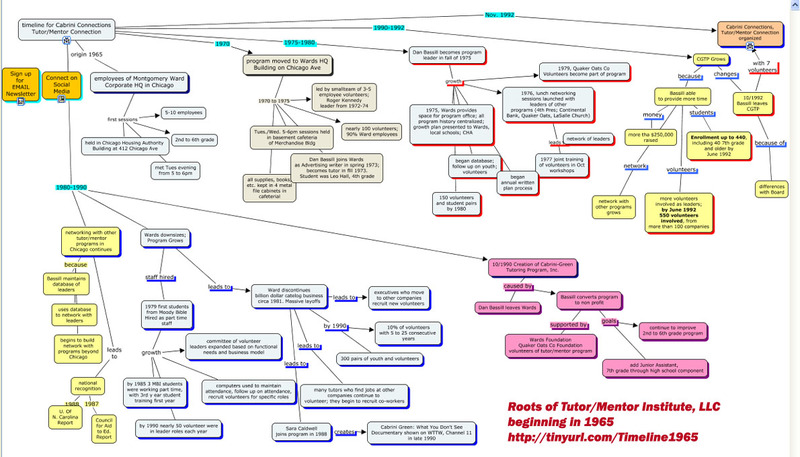 I've been following media stories with map-stories since 1993 when I formed the Tutor/Mentor Connection. Since I never have had advertising dollars to attract public attention, I try to build off of the attention the media have generated with negative news, and images of kids and suffering parents. In my stories I always post a link to the story I'm talking about. However, after a year or two, maybe shorter, these stories are no longer available at the same link. Thus, they don't have an accumulated weight that might motivate more people to become involved in trying to reduce the conditions that cause the violence in the first place. Recently the papers have been hiding these stories behind subscription services, and I feel that further reduces the number of people who will read the story and be motivated to get involved. 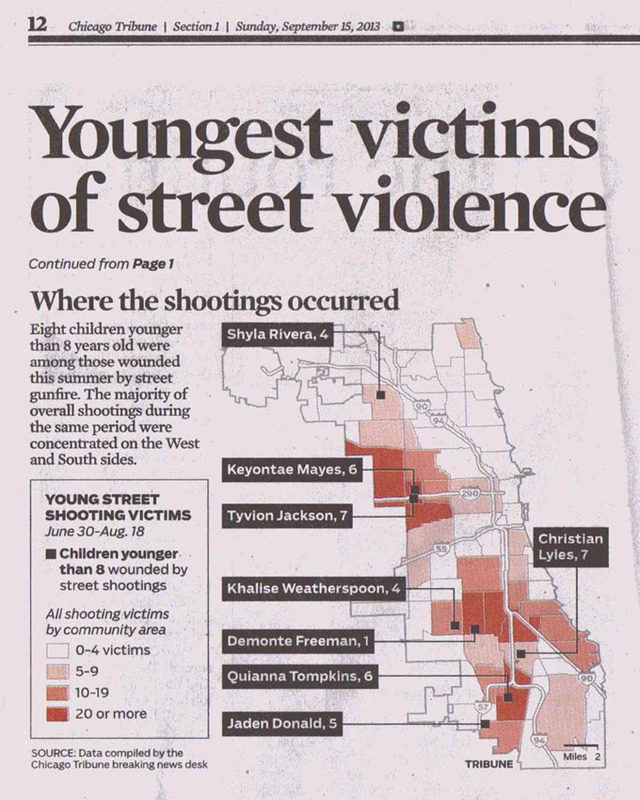 While the Tribune and SunTimes and other media have community service and charitable foundations, these only provide funding to a small group of the youth serving organizations in the city and suburbs, and only a small portion of the total funds every youth organization needs every year. Using the Tutor/Mentor Program Locator, and drawing from maps that are produced by media and other organizations, I've been able to create graphics and map stories, like below, to try to draw people together who would innovate ways to build a better distribution of resources to all of the neighborhoods where youth serving organizations and other services are needed on an on-going basis. I think youth can learn to create these visualizations. Interns working with me have been doing this for several years. You can see examples at this page. I'm hosting another Tutor/Mentor Leadership and Networking Conference in Chicago on Monday, November 4 and will be doing a series of workshops showing how to use maps to create stories, and how youth can create and communicate these stories as part of their own learning and service. I'm still looking for additional volunteers to host workshops at this conference, and others who will help build participation. If you'd like to get involved email me at tutormentor2@earthlink.net or fill out the workshop presenter form on this page. I've collected media stories that draw attention to violence and poorly performing schools for almost 20 years. I've seen passionate editorials saying we need to do something. Yet, I've not seen a consistent effort to draw people together and draw resources to youth serving organizations and schools that works like the advertising done by most corporations every day to draw people to their stores and sell products and services. Since media outlets are in business to generate profit we need to find others who will provide the resources and leadership that makes the archive of media stories more open to community activists, and that encourages media stories to point to directories of youth serving organizations throughout the region so more are supported by the people who are reading and following the daily news. What would you do to make this happen? I attended a Chicago Arts Partnership meeting on Friday, hosted by Ingenuity, Inc and the Arts Education Department of Chicago Public Schools. Ingenuity, Inc. is led by Paul Sznewajs, who founded Snow City Arts Foundation in the 1990s, which is when we first met. Much has been written about Collective Impact in the past couple of years. Paul and his group have done much to bring together more than 600 arts education groups in Chicago with a vision that "all Chicago Public School students, from the day they start school until the day they graduate, will receive quality arts education at every grade level"
During Friday's meeting Paul and others provided a history of how arts education organizations have come together in this effort and a vision for the future. 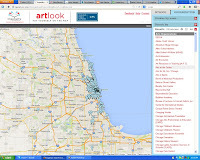 One of the resources Inginuity, Inc. has created is an Arts Look portal that maps locations of arts education providers, with layers of information showing providers of different types of arts education. This network building started many years ago and has reached out to engage many different arts initiatives. It's supported by the Mayor, and has generated a $1 million a year commitment to fund arts education programs in schools. Friday's meeting was a celebration of progress and an announcement of next steps. Very impressive. Well done. I'm impressed by what Ingenuity, Inc has accomplished because this is much of what the Tutor/Mentor Connection has been attempting to do since being formed in 1993. Our focus has been to help mentor-rich non-school tutoring, mentoring and learning organizations reach k-12 youth in high poverty neighborhoods. Our strategy has been to build a directory of existing programs and a library of information, then a larger on-going public eduction effort that would draw more consistent operating support to existing and emerging organizations. This strategy has been share in on-line maps, essays, graphics, etc. since 1998. It's a strategy that needs many leaders, but can be supported by a few who build knowledge libraries and tools that support collective efforts. We've also built a map-based directory, launched in a printed version in 1994. 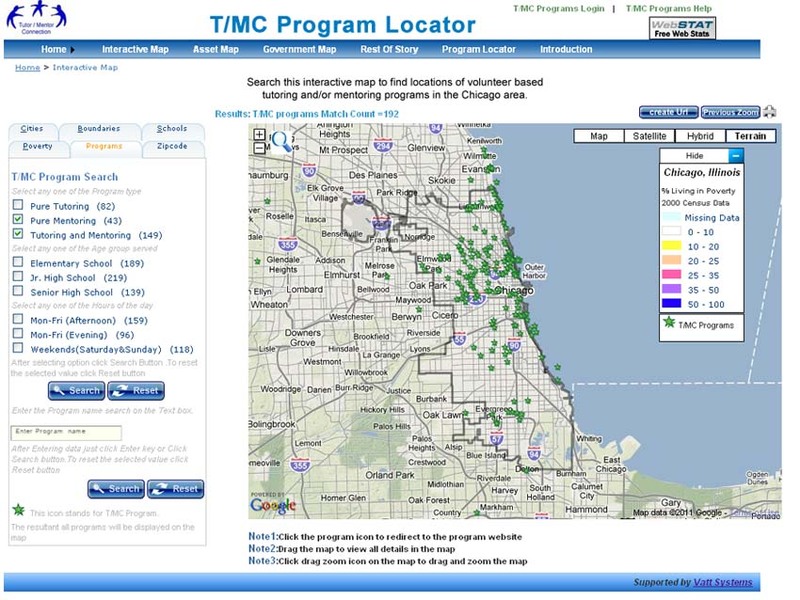 In 2004 we launched an interactive, map based tutor/mentor program locator, with layers of information showing different types of non-school tutoring and mentoring programs, and age group they serve. In addition we added demographic and school performance information to the maps so users could see where these programs are most needed. We also added an "ASSETS" section, so businesses, faith groups, hospitals, universities, etc. in the same community areas might connect and work collectively to support these programs. 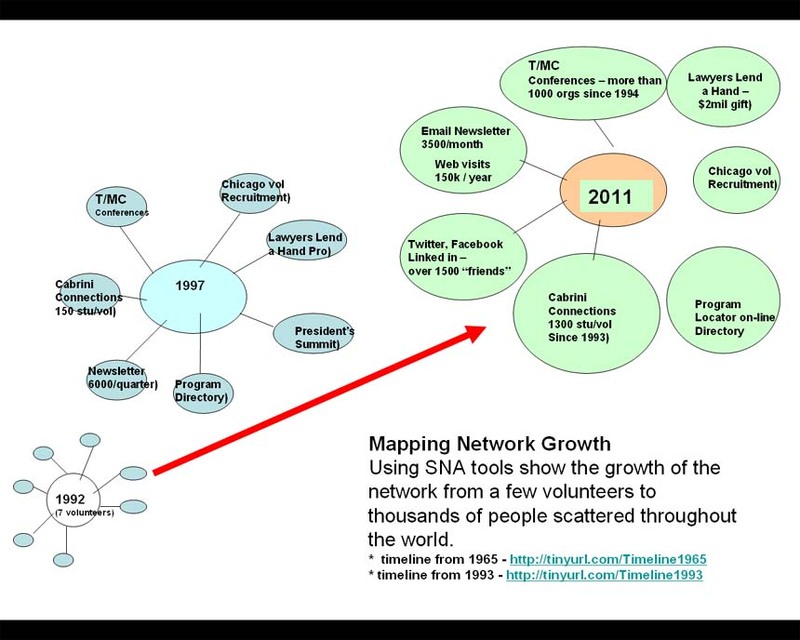 Beginning in 1994 we invited leaders and supporters of tutor/mentor programs to gather every six months in a leadership and networking conference, and in the 2000's we've invited people to gather in virtual meeting spaces. While Mayor Daley and then State Senator Barack Obama attended the Tutor/Mentor Conference once in the past, we never were able to build the type of support for the Tutor/Mentor Connection that Ingenuity, Inc. has been able to build for arts education groups. 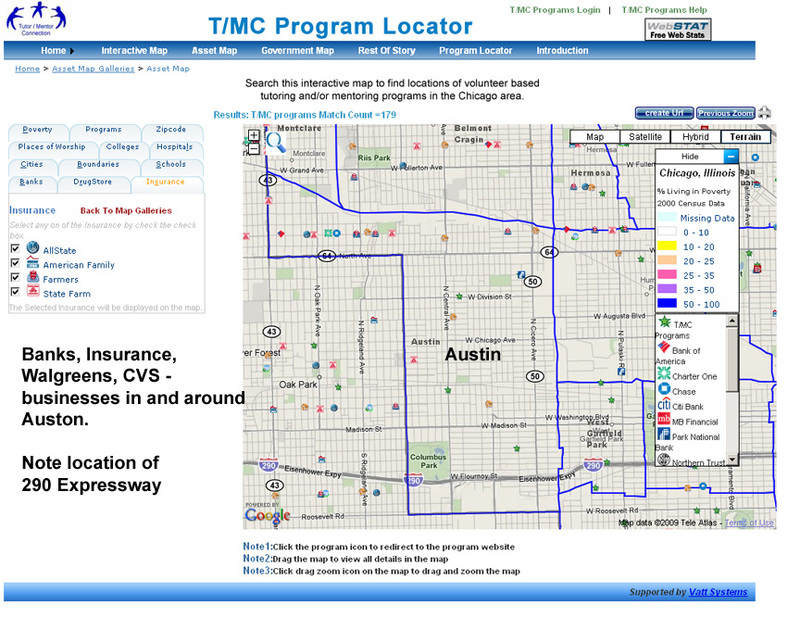 Since launching a web site in 1998 the T/MC has build an extensive library of information, with links to more than 2000 other organizations in Chicago and around the world. Anyone can use this information to support their own efforts to help kids through school and into to careers. 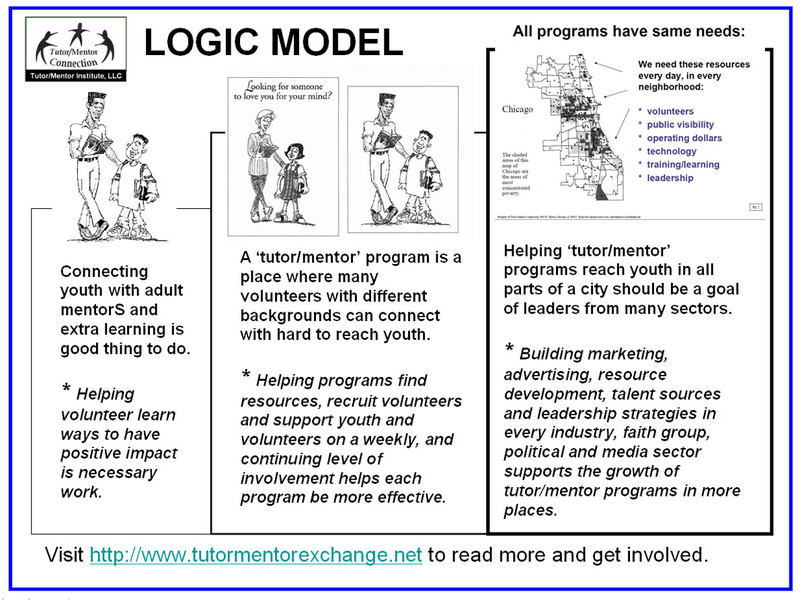 As we move into the 2013-14 school year the Tutor/Mentor Connection is now part of a Tutor/Mentor Institute, LLC structure. With so many organizations seeking leadership positions in helping kids get the attention, support and education they need to move through school and into jobs, I see my role as a catalyst, consultant, idea share, and potential partner to any of the other organizations who have been able to obtain better funding and better civic support for their efforts than I have. We all want the same end results. Finding ways to connect all of the different organizations who are doing this work will take the on-going efforts of many organizations like Ingenuity, Inc., and it will take extraordinary efforts to connect these networks with each other, and to teach leaders, donors and policy makers to use maps to help build community coalitions, and to build on-going revenue streams to support the work of everyone who is involved. 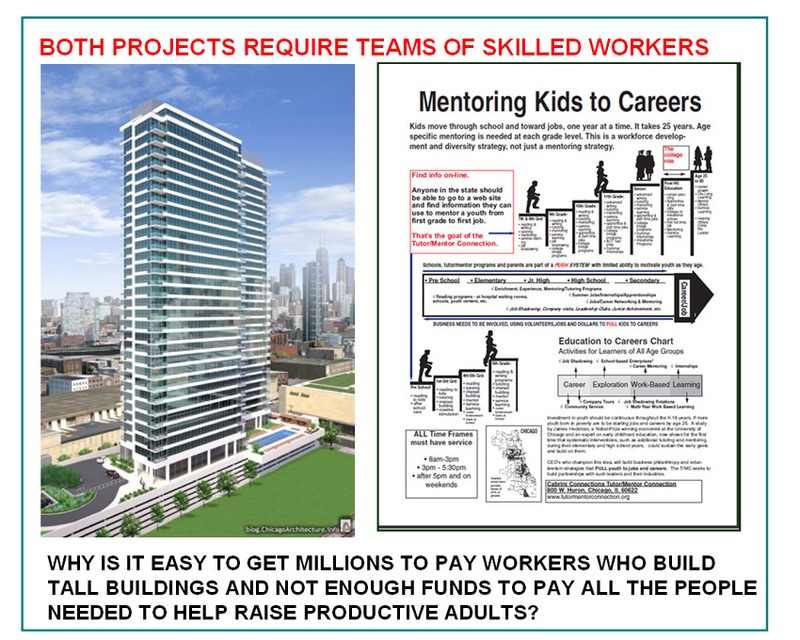 I've created dozens of graphics that compare the collective effort of helping kids to careers to that of building a hotel or tall building. At every stage of construction people with specific talents need to work together so the project can move to the next page. Everyone needs to be paid and everyone needs appropriate skills. Thus, we need to innovate ways to create public involvement and commitment to this effort, in every part of the Chicago region. To me this is where volunteer based tutoring and mentoring becomes part of the strategy. I got involved in this work almost 40 years ago when I first committed a couple of hours a week to tutor a 4th grade boy. Over time my involvement transformed my understanding and fueled my commitments. If volunteer-based tutor/mentor programs around the Chicago region are recruiting volunteers and keeping them involved, and transforming them into leaders who look at everything that needs to be done, we can mobilize the leadership and on-going support this collective effort will require. I hope you'll browse other articles I've written, visit the Tutor/Mentor Institute web site, view the graphics on Pinterest and the essays on Scribd.com. I'd be happy to be part of your effort, and would gladly mentor other leaders to support these ideas through their own efforts. If you're the leader of a volunteer-based tutor/mentor program you're probably working on volunteer and student recruitment, screening, orientation and training, and matching or students and volunteers right now. Every year from 1974 to September 2010 that's what I was doing last week and will be doing for the next two weeks. My involvement has been for so many years that it's difficult to communicate my ideas and experiences in short articles and one-on-one discussions. Thus, I've created a web site with a depth of information that any one can use as part of their own personal learning strategy. 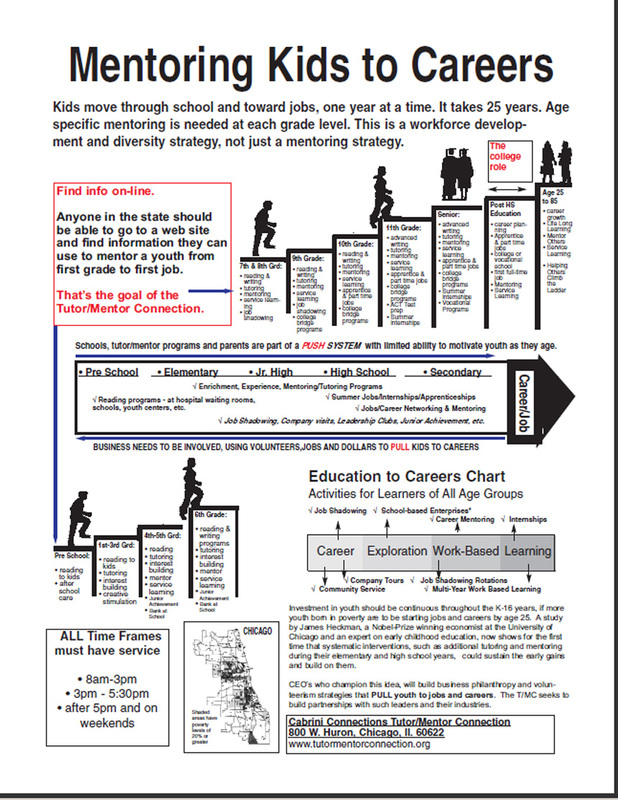 I created this time line a few years ago to show growth of the non-school tutor/mentor programs I've led since 1974, and to show the growth of the Tutor/Mentor Connection, which I formed in 1993 to help every high poverty neighborhood in the Chicago region have mentor-rich programs like those I had been leading. 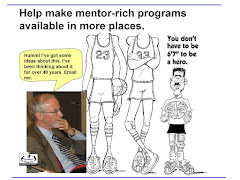 You can see from looking at the time line that the Tutor/Mentor Connection concept really began in 1976 when I started building a list of Chicago area tutor/mentor programs and inviting leaders to gather monthly for "lunch and learn" where we shared ideas, training tips, handbooks, etc. and built supportive relationships and friendships. It was this social/emotional support that kept me involved for so many years because within your own organization very few people really understand everything a leader has to do to keep the lights on and the doors open. When you connect with people who hold a similar role in other organizations, you don't have to tell what you do. They know. 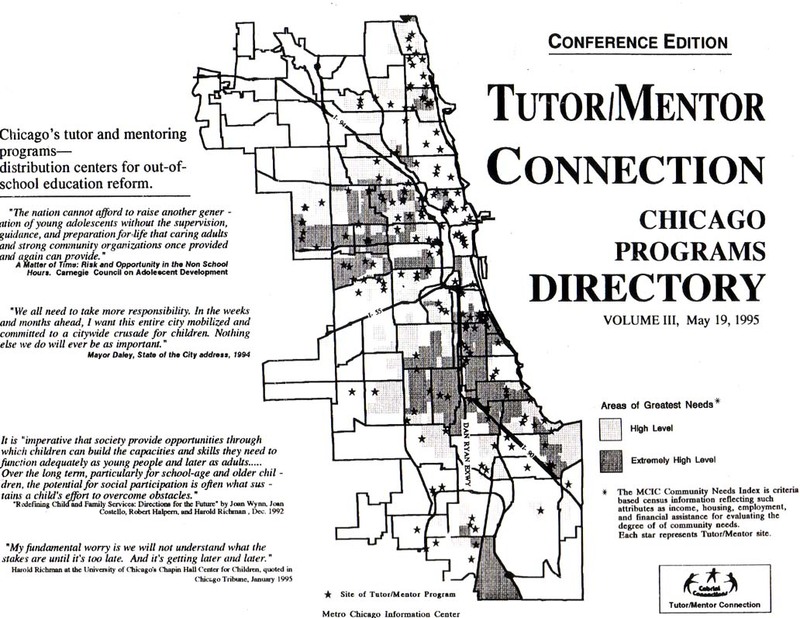 The graphic above shows the growth of the tutor/mentor program at Montgomery Ward Corporate headquarters in Chicago from 1965 to 1992. 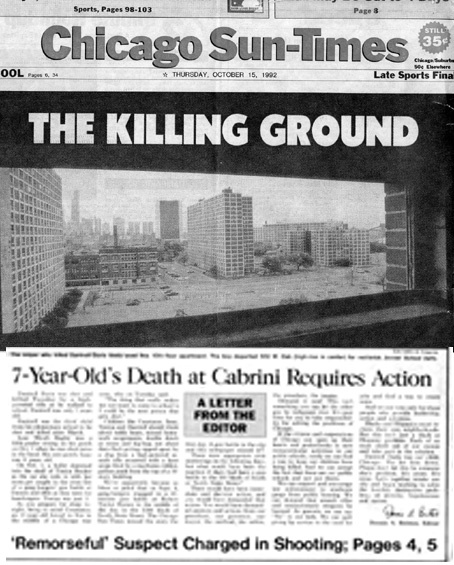 It was in late 1992 when I and six other volunteers created Cabrini Connections and the Tutor/Mentor Connection. The original tutoring program at Wards served youth from 2nd to 6th grade and included a few 7th and 8th graders. Parents kept asking us to extend the program further into high school years but since all leaders were volunteers who held full time jobs at Wards and other companies and we were serving 300 pairs of youth and volunteers by 1990, we had our hands full. By creating a new organization starting teens at 7th grade we were able to create a new structure to help kids from the original program move through high school. 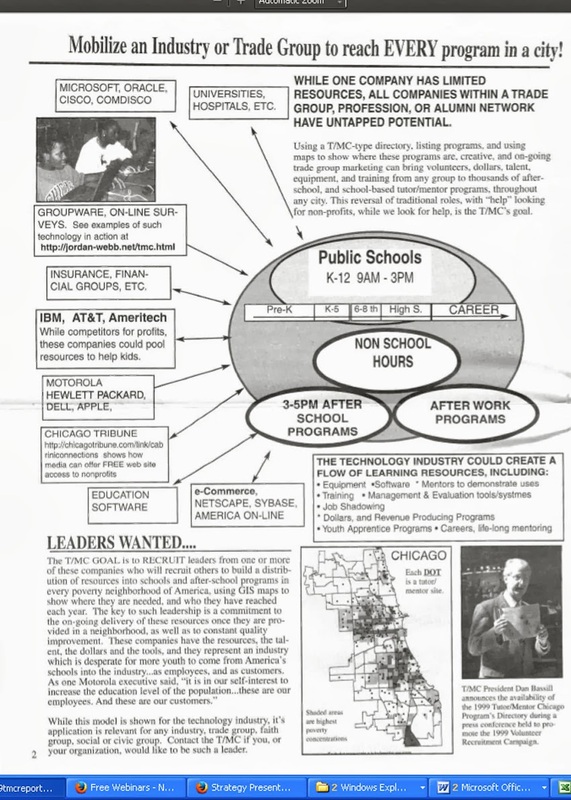 At the same time, we realized that no one in Chicago had a master list of non-school tutor/mentor programs, and thus, no leader could lead any consistent advertising/marketing intended to help high quality programs reaching k-12 youth grow throughout the city. This was during the time when 7 year-old Dantrell Davis was killed in Chicago and the media were demanding "action and responsibility". We decided to split whatever resources we could generate and created the Tutor/Mentor Connection. A second time line shows growth from 1993 through 2011 and includes milestones such as when we held the first Tutor/Mentor Conference in May 1994, when we formed a partnership with the Chicago Bar Foundation's Lend A Hand Program in 1994, and when we began to organize an Aug/Sept citywide tutor/mentor volunteer recruitment campaign in 1995. 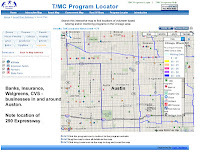 This also show when we published the first printed Tutor/Mentor Program Directory, when we launched our first web site, and when we put the Directory in an on-line Program Locator in 2004. 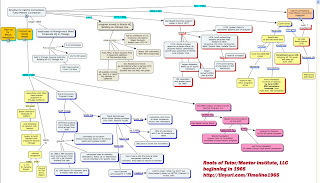 Visit this section on Pinterest to see other graphics showing significant events since the creation of the Tutor/Mentor Connection in 1993. I'm no longer leading the Cabrini Connections program (since mid 2011) and I miss that level of involvement with teens and volunteers. However, I'm still spending my time this week trying to attract the attention of volunteers, donors, media and others who will help tutor/mentor programs in Chicago and other cities reach more kids and help transform their lives as a result of the services provided throughout the coming school year. 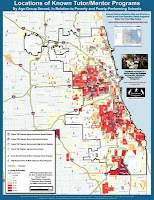 You can find a list of Chicago youth organizations at this link and see the interactive Program Locator map here. Read more articles in this blog to see how support for these programs needs to be on-going throughout the year and into coming years. If you're involved with this work, participate in the November 4 Tutor/Mentor Conference to be held at the Metcalfe Federal Building. If you're interested in supporting the infrastructure of programs and helping the Tutor/Mentor Institute, LLC do this work, contact me at tutormentor two at earthlink dot net. Or on Twitter, Facebook, or Linked in. Every week throughout the year I meet personally with three to four people, such as on Friday when I met with Rev. Mitchel Sholar, Executive Director of City Harvest Headstart Outreach Ministry (CHHOM) and Dr. Betty J. Allen-Green, Executive Director of the Chicago Lawndale Amachi Mentoring Program (LAMP). Friday's meeting, like many, was scheduled by Mitchel, who has been hosting workshops at Tutor/Mentor Leadership and Networking Conferences for the past two years. Mitchel was introduced to me and the conference via Bishop Steven Braxton,Light of Illinois Diocese, who first connected with me almost 6 years ago, also via the conferences. As we've built our relationship Mitchel has learned more about how intermediary organizations can help bring people together in a community area to support the growth of mentor-rich tutor/mentor programs that support a growing number of youth as the move from birth to work. We met at my offices at HIGHSIGHT in April, prior to the June 2013 conference, and I provided an overview of resources and demonstrated uses of maps. 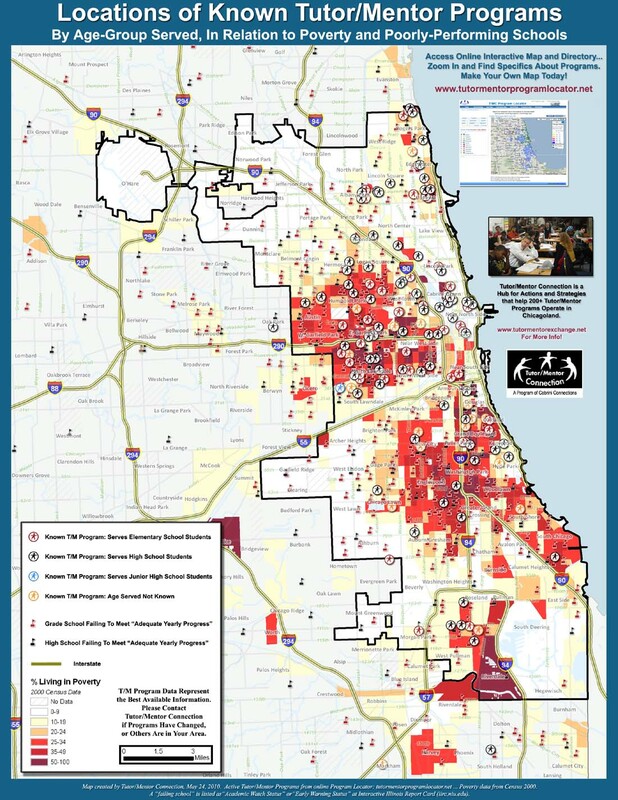 For example, this is one of a series of maps showing the number of high poverty youth age 6-17 living in community areas on the West Side of Chicago. 4717 youth in this age range are in North Laundale, which represents 55% of the total youth population of that age range. The green stars on this map represent locations of organizations known to provide some form of volunteer-based tutoring and/or mentoring in the non-school hours. 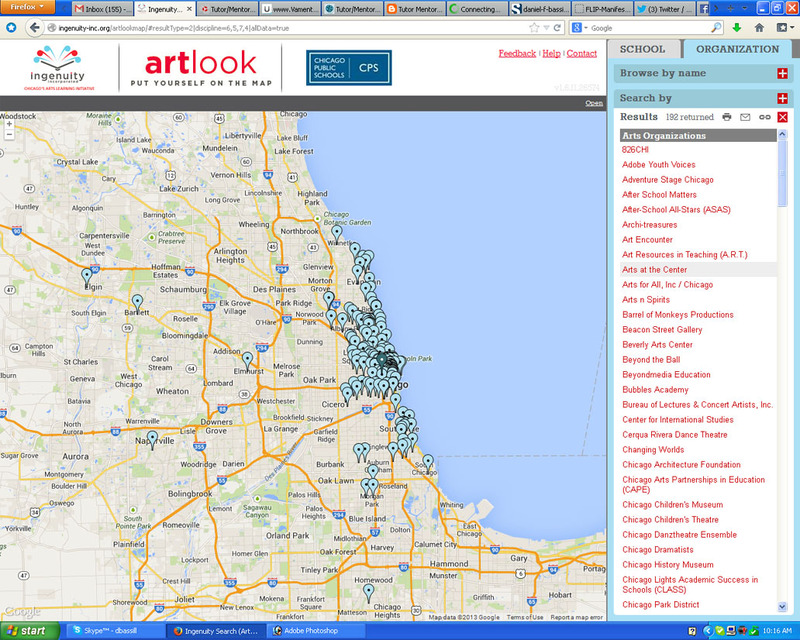 I showed Mitchel how this map was created using the interactive Chicago Tutor/Mentor Program Locator. While at first glance, one might think there are many tutor/mentor programs, when you sort by age group served, or type of program, you see fewer programs in each age group. If we had the resources to survey programs to know how many were enrolled, we'd be able to show that a very small percent of all the youth in North Lawndale are being served by the existing programs. Next I showed how maps could also be created showing assets in the neighborhood --- banks, faith groups, hospitals, colleges, insurance and pharmacy companies, etc. --- who could be supporting existing programs, and helping new ones form, by engaging their own people, talents, dollars, technology and ideas as part of a community wide collective effort. All it takes is for a group of people to begin to invite others who are already part of the neighborhood to gather and begin to learn ways they can help make the youth serving programs in the neighborhood the best in the city, and in the country by borrowing ideas from work already being done in non profits and for profits throughout the world! Mitchel is trying to take that role and meeting with leaders of existing community organizations is the first step in building partnership with others already operating in the area. Since most adults are already deeply involved in what they are already doing and have too little time to spend learning what others are doing, and ways they might innovate ways to make programs serving youth and helping them to jobs, I also showed work youth have done with me that could be duplicated by young people in their own programs, local schools and faith groups. This graphic is one started in 2006 by an intern from Hong Kong and later revised by an intern from Korea, via IIT. You can see both versions here, along with many other visualizations done since then. Mitchel's goal is to bring a group of people from North Lawndale to the November 4th Tutor/Mentor Leadership and Networking Conference, where they can discuss these ideas, build relationships, and connect with others from different parts of the Chicago region who are focusing on building tutor/mentor programs in their own neighborhoods. I support this by mentoring Mitchel and others as they take on leadership roles in their own programs and communities. While I'm able to meet with a small number of people each week, I exchange email communications with fifty to 100 people each week. I share ideas in on-line communities with several thousand each week. Following the meeting Mitchel set up a profile on the Tutor/Mentor Connection, Ning. forum. If you visit the forum you can connect with more than 450 others who have joined since 2007. If you connect with me on Linked in, Facebook or Twitter you can connect with more than 5000 others who I am friends with, and thousands of others who I connect with in on-line communities. This is labor. It's a strategy of network building that I've engaged in for over 40 years. It's work that I've been blessed to be able to do full time for over 23 years and as a volunteer for 17 years prior to that. It's work that many are called to share since so many places need mentor-rich youth serving programs, and an infrastructure of volunteers, talent, dollars and technology to support them. As you celebrate this Labor Day I hope you'll begin looking for ways you can take on a role in this effort.